The System has two water temperature sensors: (1) near the pump and filter and another (2) up with the solar collectors. 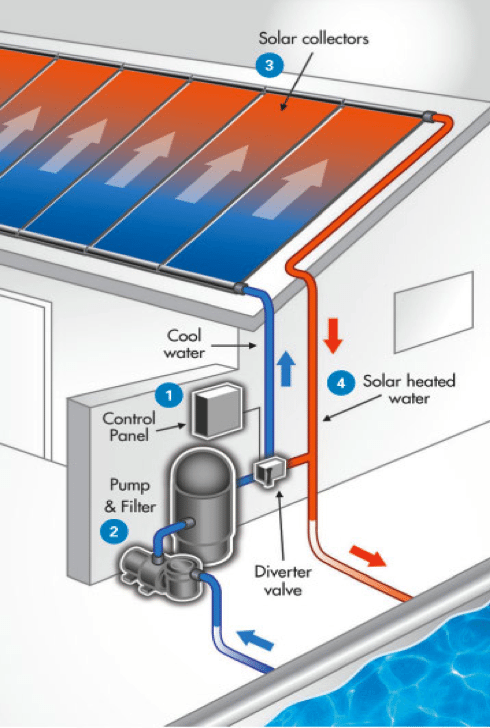 Whenever the Solar Panels (3) are about four degrees warmer than the pool temperature, an automatic temperature control system activates a motorized valve (4) to send pool water through the Solar Collectors. A Pool Heater in Florida? 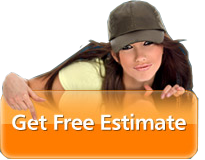 Get your estimate and start saving now! A properly sized and installed solar system should deliver comfortable swimming temperatures from Mid March through early December. Compared with conventional pool heating methods like heat pumps and gas, a solar system can show a payback in as little as 2 years! When the air temperature falls below your pool’s water temperature, large amounts of heat energy are lost off the pool surface through evaporation. A pool blanket blocks this evaporation, which allows your pool to remain at a higher temperature. Heating your pool without a pool blanket is like trying to air condition your house with all the doors and windows open. A high quality solar system should last in excess of 15 years. There are no moving parts to break and no maintenance. That’s typically twice as long as gas or heat pump pool heaters. Splash Solar Panels have a Lifetime Warranty. Is there any maintenance? With no moving parts and the use of aluminum mounting hardware, there is absolutely no maintenance. Panels that have the “separate tube design” unfortunately trap leaves and Pine needles in between the tubes causing maintenance headaches as well as an unsightly appearance. The Splash Solar product has a curved web design that does not experience this problem.